UPDATE: The Michigan Department of Human Services announced yesterday that they have taken Amanda Clayton off the Michigan Bridge Card program. Original story begins below. People love stories about someone winning the lottery and then giving the money away. They're less likely to feel fondly about Amanda Clayton, who won $1 million in the Michigan State Lottery but is still collecting food stamps. "I thought that they would cut me off, but since they didn't, I thought maybe it was OK because I'm not working," Clayton, 24, told Local 4 news in Detroit. Clayton, who says she owns two homes and a new car, receives $200 a month in food assistance from the state-issued Michigan Bridge Card, which is meant to benefit lower-income residents in the nation's eigth most economically depressed state. Twenty-five percent of Michigan's residents receive some form of food assistance from the state. The state's unemployment rate is 9.3 percent, more than a full point above the national average, but has dropped from a 10.4 percent peak in August. And Clayton isn't embarrassed about living off the state even though she now finds herself in the nation's top tax bracket. 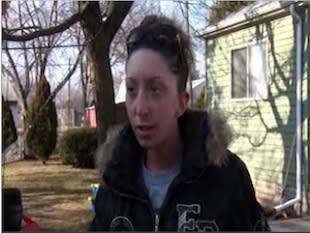 "I mean I kinda do," Clayton told Local 4 when asked if she had a "right" to the government welfare. She certainly doesn't the fit the mold of other lottery winners we have told you about here at the Sideshow, including the number of repeat winners of the Georgia State Lottery, many of whom chose to donate their initial winnings to charity or family members in need. Clayton downplayed her wealth, saying she took the $1 million in a lump sump, which meant about half immediately went to taxes. "I feel that it's OK because I mean, I have no income and I have bills to pay," she said. "I have two houses." "Public assistance should be given to those who are in need of public assistance, not those who have found riches," Zorn told Local 4. The bill, which has already passed the state House and has a sister bill in the Senate, would require the state to cross check the names of lottery winners over $1,000 to see if they are also receiving state financial benefits.